Talkler. Email for your Ears. Talkler has 20/20 hearing. 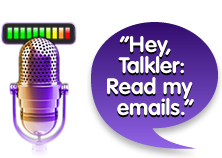 To get Talkler’s attention, just say “Hey, Talkler.” Tell Talkler what you want — like “Play my emails” or “Skip to the next email” or “Reply to this email” or “Delete this email.” Talkler is always listening for your spoken commands. Truly hands-off. Didn’t catch that last word? No worries. Talkler Teleprompter has you covered. Auto-scrolling text onscreen is always in sync with Talkler’s voice. High-contrast, oversized type is easy to read from a distance. So you can glance at the screen, as easy as glancing at a speedometer. As easy as your turn signal.™ Never take your eyes off what matters. Talkler TapAnywhere onscreen gestures work about anywhere. No searching for tiny buttons. TapAnywhere to pause and resume playback of your emails. Swipe anywhere to skip to the next email. Pinch anywhere to delete. Truly heads-up. Easiest email setup ever. Simply enter your email + password — Talkler 1.4 with QuickConnect does the rest. No more searching for tricky server addresses or port numbers. 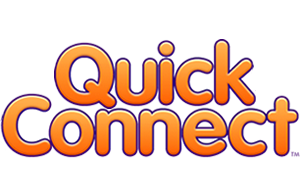 QuickConnect looks them up + enters them for you. Almost any email service, even custom domains. Download Talkler for FREE to get “Talkling” now. Easy as voicemail. Just record & send. Emails attached MP3. TapAnywhere™ taps and swipes work wherever your finger lands. Designed for at-a-glance ease. High-contrast and readable at a distance. No memorizing the ‘right’ way to say it. Just say what you want. Talkler gets it. ‘Hey, Talkler: Speak faster.’ ‘Speak more slowly.’ Find the perfect balance for you. Works with wireless headsets, built-in and aftermarket car Bluetooth systems. Brilliant with wired headsets, too. Enter your email + password. Talkler does the rest. No tricky server addresses or ports. Records every inflection. No proofing. No typos to correct. Just ‘pinch’ anywhere onscreen to delete an email. Heads-up and eyes-free. Speech recognition right on the phone isn’t vulnerable to hacks from round trips to the Cloud. Accelerometer-aware. Like tapping Talkler on the shoulder. How’s that for attentive? Prefer a Baritone to a Tenor? Talkler’s voices are always music to your ears. Talkler Teleprompter™ ensures voice and text are always in sync. Perfect at-a-glance confirmation of that last word. Connect your company email. Exchange, ActiveSync, Outlook, custom company domains. Free to download. Free to use. For anyone. For serious email users, upgrade to the ad-free Talkler experience. Raise-to-Ear mode for privacy. 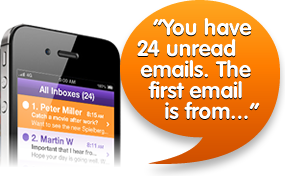 Just like a phone conversation, with your inbox. No gobbledygook. Simplifies URLs, abbreviations… For easy-to-follow reading aloud. You might not spend much time actually looking at Talkler. But you’ll like what you see when you do. A true GAME-CHANGER! Definitely give it a try. Great example of voice recognition… Easy to download and set up. while driving, running, cooking, or being busy with practically anything. INNOVATIVE… Easy to navigate and operate. The developers have done an excellent job with Talkler’s speech. Their dedication to accessibility is to be commended. I’m LOVING TALKLER… I was drowning in email, and now I have a lifeline! I spend a lot of time in my car… Now I still get my work done. Can’t get Siri on iPhone 4, so this sounds great! every time you drive… COOL FEATURES. — Desiree Baughman, InsuranceQuotes.org, "5 Apps That Will Make You a Safer Driver"
Shocked that Siri can’t do this… HIGHLY RECOMMEND this app.